Well I've been told I'm out for the season so I need something to do while my back heals up. 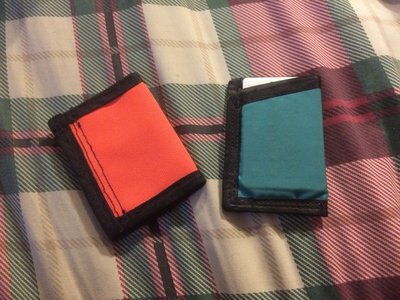 Any of you guy interested in helping out a homie and buying some rad wallets that are handmade in Alberta? I have a ton of colours leftover from backpack projects. Heres a couple pics on what the look like. Blue one holds about 5-6 cards and has an elastic band on the back for cash. 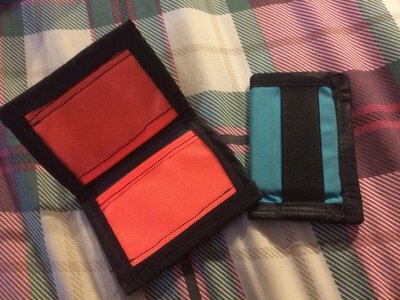 Orange one is made specifically for cards and each side could hold 4 cards snugly. Prices would be around 20Cad and 15USD plus shipping. Something to consider is the size of US currency vs. the size of Canadian currency. US bills are much larger, and these wallets do not look like they would fit the USD. iFlip Something to consider is the size of US currency vs. the size of Canadian currency. US bills are much larger, and these wallets do not look like they would fit the USD. you fold the bills up and slide them back underneath the elastic. it works with both! jellomellow you fold the bills up and slide them back underneath the elastic. it works with both!